We have published our Modern Slavery and Human Trafficking Statement for the year ending 30 June 2018. Seed Recommendations - Peter Riley of PN Riley Ltd and Farmacy Plc – will give seed recommendations and discuss present and new varieties followed by a Q&A session. Dewing Grain Seed – Josh Dewing – highlighting proposed varietal choice for intake harvest’19 and available buy-back contracts. Grain Marketing Update – Dewing Grain - will provide a concise market report and offer our views and marketing strategy for the year ahead. Please RSVP by 22nd May to 01263 731550, or email info@dewinggrain.co.uk. Dewing Grain shall be running moisture meter clinics, one at Yaregrain on Monday 3rd July and one on Wednesday 5th July at Aylsham, the times will be 9am-4pm for both sites. This will cost £10 per machine and we will have samples for Wheat, OSR and Barley. Seed Recommendations - Peter Riley, PNR Riley – We are very grateful to Peter who will once again bring us up to date with recommendations for present and new varieties followed by a Q&A session. Dewing Grain Seed – Josh Dewing – briefing Store Members with proposed varietal choice for intake harvest’18 and specific buy-back contracts. Grain Marketing Update – Dewing Grain - will provide a short market report and offer our views and marketing strategy for the year ahead. 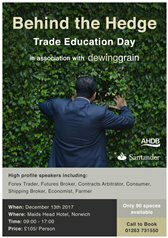 Please RSVP by 17th May to 01263 731550, or email info@dewinggrain.co.uk. Andrew Dewing will be speaking at the Anglia Farmers Norfolk Farming Conference on Thursday 2 February. 20 Years ago today Andrew Dewing came to Aylsham Grain to take on the grain marketing. Since then Dewing Grain was formed and continues to be the primary marketing agent for Aylsham Grain. Seed Recommendations - Peter Riley, Prime Agriculture – We are very grateful to Peter who will once again bring us up to date with recommendations for present and new varieties followed by a Q&A session. Dewing Grain Seed – Josh Dewing – briefing Store Members with proposed varietal choice for intake harvest’17 and specific buy-back contracts. Please RSVP by 27th May to 01263 731550, or email info@dewinggrain.co.uk. Whichever way the decision goes, stay in or get out, there will be significant changes to present and forward prices. If fundamentals and weather were taken out of the equation, the Brexit result will affect currency. Stay in and the £, in the immediate future, will strengthen, the down side is that exporting commodities will lose their competitiveness and grain prices will fall. If the £ returns to a rate as seen in 2015, prices could reduce by 16%. Getting out will possibly mean further weakness in the £, exports will be more competitive but potentially improving prices by 8%. The volatility of prices will continue to make grain marketing even more difficult, it is proven that using marketing tools reduce risk and improve the resilience to market volatility. For further information on grain marketing please contact us. Dewing Grain is running grain marketing pools for 2016 harvest. There are four periods that can be committed to, please see basic outline and payment dates below. If however you do not wish to commit to a pool, but would rather Dewing Grain market your grain on an individual basis, please contact a trader at one of our offices: Aylsham 01263 731550, Cantley 01263 700447 or Holkham 01328 598004. They will be happy to discuss your requirements. Following a recent downturn in prices, a number of farmers asked us to take responsibility for their marketing. This season’s pools proved very successful and consequently we decided to re-introduce the following four pools: Harvest Pool (July, August, September), Autumn Pool (October, November, December), Spring Pool (January, February, March) and Summer Pool (April, May, June). Dewing Grain has recently launched an online portal for farmers. During January, they will receive login details enabling them to access all their account information including current and historical data covering the ledger account showing invoices and payments, contracts, weights, fixings and sample data. The portal will also provide the facility to print off copies of invoices and contracts. Dewing Grain is delighted to announce its 10th Anniversary. Over the past 10 years we have grown year on year, establishing ourselves as the biggest Norfolk based independent grain merchant. Our success has been and always will be to work closely with farmers and end users, added to which, the team is dedicated. We would like to thank all those that have stood by us in the early years and those that we currently work with. We will continue grow, be innovative and maintain our high standards in the future. As previously stated there is going to be a very difficult period for pricing wheat if it needs instant movement. The sooner you quantify the tonnage you have to sell, the better for you in terms of price. There are several reasons why the market could go up after harvest, the main hope being the heat damaged French/Eastern European maize crop, but there are also reasons why a price recovery is not guaranteed. The Chinese decision to devalue the Yuan has written 2% off commodity values and the threat of their economy cooling is a sign that they will not be importing as much as anticipated, this means that Maize and Soya has less customers and reduces the fear of shortage. On a positive note for price, malting barley has come into store in great condition and yields have been good, but Scotland has not enjoyed a warm sunny summer and their crop is looking backward and not likely to perform well. There might be a bit of extra demand coming for perfect Norfolk barley. OSR is all but over in our county and the harvest is moving North into Lincolnshire and Yorkshire. When the harvesting finishes we believe the barn doors will be firmly closed on this crop so values should see improvement. The only dark cloud is the Chinese issue mentioned above and a reduction in Soya purchasing but the Soya crop has plenty of weather scares in it yet so we should see a rally. Finally… Storage is a fundamental requirement to deal with production. Customers that cannot receive the produce at the time of need can blame the end user but it does not solve the problem for their farmer. Take responsibility for the storage/movement yourself and do not assume the eternal optimists view of sunny, dry harvests every year. You need to harvest, get the grain into the correct condition and store it or harvest and move immediately to a place that protects your price. Nothing other than the weather should hold up your harvest. For the first time in 20 years at Aylsham, I have seen every commodity we trade (except pulses) harvested on the same day. This is putting grain movement under extreme pressure, add to that high yields and inevitably something has to break! The trade is not geared up to cope and somewhere in the near future the price is going to take the hit - regardless of other world events. After the rush is over and the barn doors close there are many reasons for a price recovery, mainly around corn (maize) production in Europe and the US. If you have adequate storage and strong nerves there should be similar prices, at least, to the current values after the mayhem. The early yield reports on wheat are very good from strong to medium land, this might also give a further negative effect to prices. The good news is the opportunity to harvest everything in a dry condition which gives the opportunity to store in sheds that could not handle wet grain. OSR harvest is nearly completed in Southern England and we expect to see a firmer market kicking in after the movement rush is over. South Pickenham estate have erected a 26,000 tonne store just off the A47 (near the McDonald's roundabout at Swaffham). We will be filling the surplus to the states production in the facility. There are two 13,000 tonne flat stores with drying facilities on-site. Turnaround will be quick with "tail board" tipping in the sheds and a 120 tonne-per-hour intake pit. Fransham is a new 5,000 tonne shed built by Robert and Ed Salmon. The farm is looking to the future and the possible opportunities of increasing their contract farming agreements, having sufficient capacity to offer storage as part of the deal is an attractive benefit. Our agreement is to fill the excess space to maximise store income and bring the benefit of the higher price achieved by registering the site as a Futures store. This is the tried and tested model we have used at the other sites we have storage agreements with. You can find a list of other stores here..
To discuss seed please call Josh on 01263 731550. We have been asked by a number of our farmers to organise grain pools for the 2015 harvest season. The complexity of price potential in either direction is greater this coming year than normal and the current values at or below production cost is creating unnecessary stress. A pool by definition gives a fair average price taking out the highs and lows which for many is a happier way to trade than taking your chances with the extremities of weather, politics and the grain trade. We have decided to go ahead and run four pools and have designed the simplest of systems on which they will run. Our pools will use options if we deem it necessary or if we see an advantage to the pool members. Our objective will be to achieve the best pool price against the various alternatives that you have. Harvest movement, which means immediately, Payment date 15th September. Movement anytime between October 1st and Dec 21st. Pool Payment date 31st December. Movement anytime between January 1st and March 31st. Pool Payment date 7th April. Movement anytime between April 1st and June 30th. Pool Payment date 21st July. Increments will exist within pools for later movement months. All grain will be delivered locally with no extreme haulage risk to farmers. Option on haulage to local delivery points will be offered if market conditions allow. If you wish to be part of our Pools please fill in the attached form. Closing date for applying to join our Pools is Thursday 30th April 2015. We are pleased to announce a new store for 2015 at South Pickenham. In time for harvest, construction of a new 26,000T grain store will be complete at Grange Farm, South Pickenham, establishing a local delivery point to service surrounding growers. We have proven around the county that this model works as growers see the benefit from being paid to haul their own grain direct to store at their convenience. The site is very easily accessible, situated just off the A47. Intake will be open for full harvest hours (7am-7pm Mon-Sat) to allow as much as possible to be delivered direct off the combine. The store will be a registered ICE Liffe Futures Store and therefore will be able to offer a premium market for your crop. For further information please call us on 01263 731550. Dewing Grain now have a grain trader based at the Yaregrain store in Cantley - please feel free to drop in and discuss grain marketing, get up to date prices and have access to our testing equipment. Or come and have a look round the new and improved storage and processing facility. There will be a trader on site every day except for Tuesday. Bring your moisture meter to the Cantley Office on Thursday 3 July between 8am and 4pm and we will calibrate it for you using standardised samples. This service will cost £10 per machine, payable at the time. Bring your moisture meter to the Aylsham Office on Wednesday 2 July between 8am and 4pm and we will calibrate it for you using standardised samples.